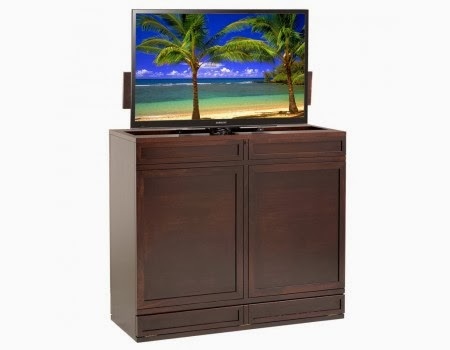 We believe that part of the appeal of owning a motorized TV lift or a TV cabinet is to incorporate it into the design of your living or work space with minimal impact on the design of the room. Our cabinets and mechanisms are designed for utility, but not at the cost of visual appeal. In keeping with this goal, we offer several different lines of cabinets, divided into modern and traditional styling. In addition, our cabinets are available in different stains and finishes to fit just about any situation. For the rare case that the customer is looking for something special or particular, TV Lift Cabinets offers custom construction and design help. We can build a completely custom cabinet from scratch (starting at $3999.00), make custom-sizes for our stock cabinets, or simply add a custom finish to one of our production cabinets, starting at $299.00. In our experience, a classically-styled cabinet with a lift-mechanism can really stand out in a room. In rooms that use classical styling, adding a matching cabinet can give a room a modern flair. If you have a particular design in mind, let us know. Our architect can draw, render, and send you the design for approval so you know exactly what you will be getting, and can be sure that it will be perfect for the space.